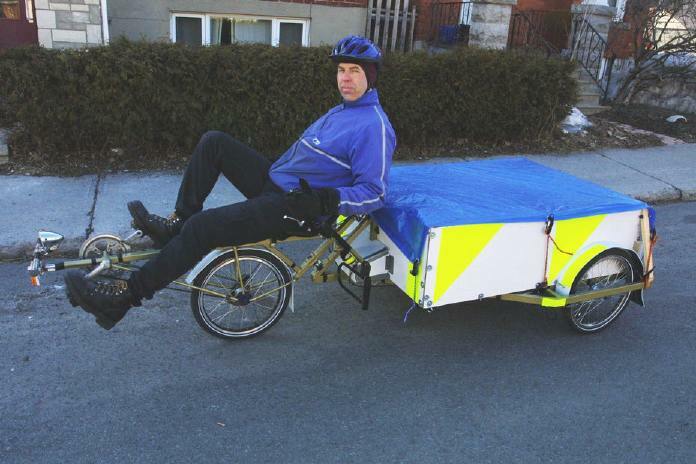 All new info on the trike is at my blog under cargo trike. Links to posts detailing structural or operational changes will be added below, newest to oldest. The handlebar crosspiece finally cracked at its mount and had to be repaired. A pair of braces were also added to stop this bar from flexing. See my blog post for the while story. In May I upgraded the electric-assist battery pack to 48-volt 12ah, and this boost has made a nice difference! Then in October I gave the pack a more semi-permanent installation. Courtesy of my friend Juergen and his Acclivity Solutions, the trike just got an electric-assist motor. Details at my my blog. The creation of this machine filled a dream I'd had for quite a while. As you may know from reading elsewhere on my site, my primary work is as a drummer/ percussionist, and since going car-free back in '99 I have had to ask others to help me move my instruments. And for many occasions, this works out fine, because the band is often travelling some sort of distance, and it only makes sense to pile everyone and everything into the van and off we go. But a fair amount of my work is within a few kilometers of where I live, particularly in the summer when I play a lot of outdoor shows in various parks and plazas around town. And I had always figured it would be great to just cycle to a gig with drums in tow, and not wait for someone to give me a lift and worry about parking when we got there. But drums, while not being all that heavy for their size, do take up a fair amount of space. I thought about building an even bigger trailer than the utility one I already have, but figured it might be a tad unwieldy for just a skinny bike to pull. I wanted something a bit more sturdy, a sort of human-powered pick-up truck! Over the years I had seen vehicles such as the Brox (but it doesn't carry too much of a payload), and the HPM Tri-Hauler. I liked this last design, and one that is quite similar is the Organic Engines SUV (sensible utility vehicle). Both of these are front wheel drive with the steering pivot behind the seat. The Tri-hauler seemed like it might be a little easier to build, but its head-tube would take all the load, and the SUV looked a fair bit sturdier in this area. Enter fellow HPVOoO member and guy with a welding torch, Juergen Weichert. I was talking to the gang about trying to build something along the lines of one of the above trikes, and he simply says "I'll help you. You pay for my welding gas and all the materials, and I get to practice". Sounded good to me! We settled on copying the Organic Engines design, and corresponded with proprietor and creator Dan Kavanaugh, who kindly gave us some basic dimensions and tubing sizes. From there Juergen and I had to figure out the rest. Some of you may be curious as to how this thing was built, so I've created separate webpages with more or less complete construction details and photo documentation. So please go to my trike details page. Or you can skip all that, and head right to the action shots! The first step was to determine how much stuff I needed to carry. So I got out the drums I use most often, and arranged them on the floor to see how much area I would need. The least flexible piece was the hardware box at just over three feet long and approx. one foot high and wide. I decided it should go at the rear of the cargo box, since that was where the wheels would be and so it made sense to put the heaviest thing over them. But with its width it meant for a fairly wide cargo box, with the wheels being outside of that. I didn't want to put it along one side, as I thought that might unbalance things a bit (since the drums themselves inside their cases don't weigh all that much). I guess in retrospect I could have perhaps moved the wheels forward and inwards and had the box at the back behind them, but since I would also like to set it up like a pedicab every now and then the extra width would be necessary to carry two people side by side. Now that the trike is built and in use I must say that I am quite pleased. It's very first job was our local St. Patrick's Day Parade, as I got to be lead vehicle with the HPVOoO contingent and was carrying 350 lbs. (160 kg) of P.A. equipment! After that I made some trips from the local bike shop were I work part-time down to the re-Cycles bike Co-op where I volunteer. On the first trip I carried 22 wheels, and on the second trip it was five boxes of old parts and accessories. About two weeks later I was finally able to use it for its intended purpose of moving my drums, and that went very well. I do get a litle paranoid about locking it up at night on the street or in a parking lot while I'm busy performing, but I've got a very stout Kryptonite lock on it and that's about the best I can do. Hopefully the fact of it being homebuilt and mainly with used or ordinary parts might discourage theft. The only issue I'm noticing so far while riding (and this will be old news to others who ride trikes) is road crown! That is, the tilt in every road from the centre to the edge, needed to facilitate water run-off. One never notices this on a bicycle with its two inline wheels, but with a multi-track vehicle like a trike you definitely feel it! And so on some of our local roads there's more tilt than I'd like, and I have to make an effort to keep the front end straight, since there's a fair bit of forward weight due to the mid-ship hinge. Copyright 2009 Mark Rehder; Ottawa, Ontario, Canada.